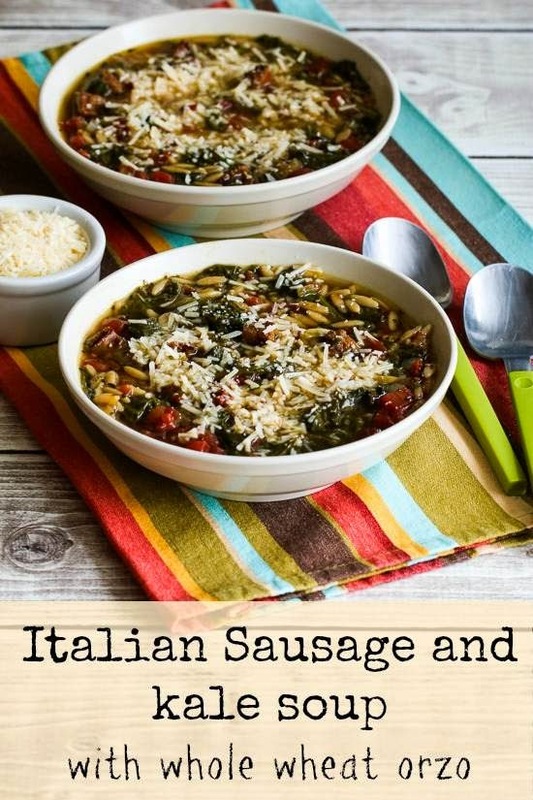 I love this Italian Sausage and Kale Soup with Whole Wheat Orzo. If you don't have orzo, use some broken pieces of whole wheat spaghetti! I'd probably never heard of Whole Wheat Orzo Pasta in 2010 when I first made this Italian Sausage and Kale Soup using broken pieces of whole wheat spaghetti, but orzo is such a perfect soup ingredient that when I decided to update the recipe with better photos, it seemed like a perfect switch. So now I have to rename the recipe to Italian Sausage and Kale Soup with Whole Wheat Orzo, don't I? But no worries if you don't have orzo (or don't want to buy it), go ahead and break up some spaghetti into short pieces to add to the soup. You could also make a delicious lower-carb soup using this recipe by leaving out the pasta completely.